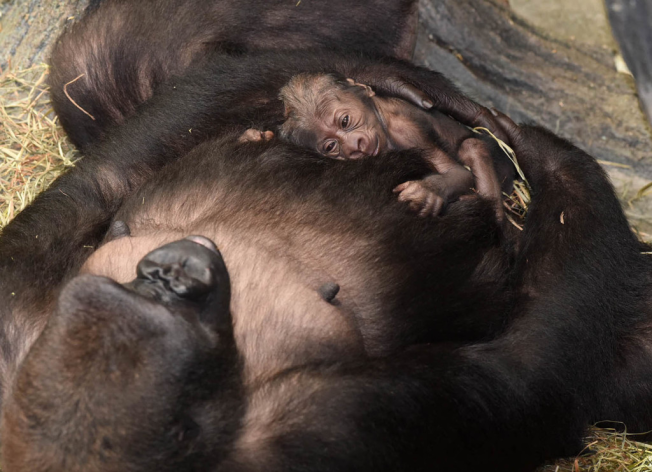 A western lowland gorilla born on September 23 with its 11-year-old mom Kamba, can be seen in Brookfield Zoo’s Tropic World: Africa habitat. This birth marks four generations of western lowland gorillas currently in the group at Brookfield Zoo. Western lowland gorillas are critically endangered primarily due to commercial hunting for the bushmeat trade and disease such as the Ebola virus as well as illegal pet trade and habitat destruction from logging.